"...Western's international profile will rest largely on the strength of its research enterprise, and the research enterprise requires talented faculty and graduate students with the time and resources to pursue innovative ideas." "...Building a research-intensive university is the most important priority. It goes hand in hand with the goals of expanding and enhancing graduate programs, as well as with raising Western’s global profile." Western ranks among Canada's top-10 research universities according to numerous input and output measures, and has many areas of scholarship and research where we can lay claim to being both a Canadian and global leader. This Strategic Plan challenges our campus community to aspire to become a more preeminent research-intensive university by raising our stature nationally, and expanding the number of areas that achieve excellence on the world stage. Meeting this challenge starts with creating a culture that places a higher value on scholarship and innovation, one that strives more intently to increase the impact and productivity of our research and scholarly activities across and between the disciplines. To support this priority, Western will focus more attention and resources promoting and rewarding (1) excellence in scholarship and innovation; (2) knowledge creation; and (3) the translation and mobilization of that knowledge into languages and applications useful in the public realm. Invest selectively in interdisciplinary areas of strength: Many of the significant problems facing humanity today are enormously complex, and the greatest advances made in solving them emerge at the boundaries and intersection of disciplines. Western's response to this reality is to promote collaboration and build operational capacity for interdisciplinary research. An essential prerequisite for building this capacity is to maintain, and, where necessary, strengthen a base of support for traditional disciplines across the academy while also allocating incremental resources selectively and strategically to drive interdisciplinary activity. Western will use a diverse set of tools available to support interdisciplinary research. These include creating University-wide institutes of high impact, building the Clusters of Research Excellence Program, establishing endowed chairs, increasing peer-reviewed external funding, and allocating internal resources. Further, Western will create 100 research chairs, including 50 new endowed chairs supported by funds raised from private donors and industry partners engaged during our "Be Extraordinary" Campaign. We will also create a new Strategic Excellence Fund for future investment when appropriate opportunities arise. Increase focus on research inputs: In many disciplines research cannot be undertaken without access to research grants. Accordingly, greater success in securing research funding from all potential sources is essential, in terms of productivity and impact, to creating a world-class research culture. Graduate student support and postdoctoral research are heavily reliant upon external research grants and fellowships. The Federally Funded Indirect Costs of Research program provides funding for our Libraries. The number of Western's Canada Research Chairs, and the Canada Foundation for Innovation funding envelope for Western are both determined in ratio to our success in attracting Tri-Council grant support. To this end, Western needs to increase its share of funding from the federal Tri-Council granting agencies (i.e., SSHRC, NSERC and CIHR). In addition to the granting Councils, efforts will also be directed to securing funds from non-traditional sources, including foundations and international agencies. Plainly put, if Western is to improve its overall research standing, all disciplinary areas need to increase the quantity and quality of funding applications to the Tri-Councils and other external funding agencies. Increased emphasis on and support for this institutional priority will enhance Western's profile and reputation at the national and international levels. Increase focus on research outcomes: Western will maintain a strong focus on the quality and quantity of our research outcomes and their dissemination. This will mean different things to different people—from citations in the most prestigious disciplinary journals, to monographs and books published by leading presses; from keynote speaking engagements at national and international conference plenary sessions, to musical performances on the world's international stages; from scholarship that shapes public policy, to business cases that inform entrepreneurial decision-making; or from curiosity-driven enquiry, to scientific and technological innovations that can be commercialized for application in health care and by private industry. Regardless of the discipline, increased research intensity will raise Western's profile in the eyes of those who benefit from our intellectual activity. This enhanced institutional profile will aid all Western researchers as they compete for peer-reviewed research grants and seek to publish in prestigious venues. Recruit and retain senior faculty: Western recognizes that its institutional reputation results largely from the talent and effort of its people. Accordingly, it is imperative that Western attract and retain the very best people to teach and support our students, and to lead our research enterprises. Our normal practice has often tended toward the recruitment of junior faculty. In many instances, however, our requirements tend toward the need for more experienced and senior talent to provide leadership to our scholarly endeavours. Western will give greater consideration to hiring established scholars with proven track records in research and teaching in select areas, in addition to high-potential junior faculty of proven ability. Address societal needs for "Highly Qualified Personnel": In today's knowledge-based global economy, the demand for individuals who can create new knowledge or who can critically assess and apply new knowledge continues to rise. Our society also needs people who can provide leadership in recognizing, defining, and engaging the world's increasingly complex challenges. Western affirms its commitment to meeting societal need for highly qualified people across all disciplines. 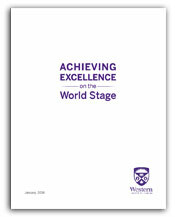 We will achieve this goal by providing the educational programming, research training and experiences that develop the talent of our undergraduate and graduate students, postdoctoral scholars, medical residents and fellows so that Western graduates are well prepared to be leaders in their chosen endeavours on the global stage. Partner with other institutions and communities: A critical element to increasing the impact of our research and scholarly activities is to engage more actively with colleagues in the broader global academic communities and to pursue additional opportunities within private sector and non-profit communities. Western faculty, postdoctoral scholars, librarians and archivists and staff are already involved in many such mutually beneficial partnerships nationally and internationally. These endeavours serve individual research interests and also expand the sphere of our University's reputational prominence in Canada and abroad. We must identify and pursue more opportunities to advance and apply knowledge in partnership with the private sector, non-profit sector, and specific communities within the broader public (e.g., Aboriginal and immigrant communities). Celebrate our colleagues' successes: We are proud of the people who work at Western and understand that building our University's reputation depends on their continuing success. More of their individual achievements could and should be recognized. Viewed collectively, individual accolades such as election to the Royal Society of Canada, or being awarded a Guggenheim Fellowship, the Killam, and Polanyi Prizes (to name but a few examples), all raise the overall reputation of our University and all of its members. Western will invest more resources and develop effective processes to identify, nominate and celebrate colleagues who merit the recognition conferred by high-profile external award programs. Bring the world to Western: Academic conferences, symposia and other special events and programs attract visitors to our campus and shine a spotlight on all that Western has to offer. Western has enjoyed success in hosting large-scale events, from the discipline-specific to the multi-disciplinary (e.g., the Congress of the Humanities and Social Sciences), to the inter-disciplinary, all of which engage academic communities from around the world. Western will continue to support multi- and inter-disciplinary collaborations with internationally recognized academics who can help raise the profile of Western's areas of strength. We must also increase our efforts to take Western to the world. Faculty, staff, students and alumni contribute to this effort as ambassadors for Western when they attend and present at meetings, symposia, conferences and other academic/professional functions hosted by international institutions and organizations. Engage our Libraries as partners in research and scholarship: Western recognizes the unique role played by Western Libraries in creating, disseminating, and preserving knowledge. Librarians, archivists and library staff interact with members of the campus community across the disciplines in support of these crucial University missions. Our librarians and archivists also create knowledge through their own academic activities. Western Libraries will continue to support a strong research and scholarship culture by maintaining and selectively enhancing the quality of our library and archives research collections; providing appropriate physical and virtual library research environments; expanding opportunities to disseminate research results; and ensuring individual researchers and research teams have timely access to the requisite librarian, archivist and library staff expertise.